How do I conduct an oral history interview? What can you do with an interviewee who doesn’t seem to want to share? How is oral history different from other forms of research and scholarship? 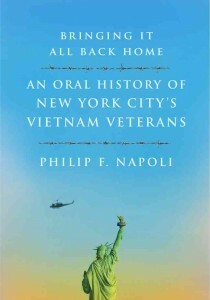 Bringing It All Back Home: An Oral History of New York City’s Vietnam Veterans is now available for pre-order at Amazon. Also at Barns and Noble, and Powell’s Books. This entry was posted in Bringing It All Back Home by Administrator. Bookmark the permalink. I been waiting to hear from you about the book. When my computer went down ,I lost all you information. Marty, You Rock. Book will be out in early summer! I would like to purchase at least three copies!